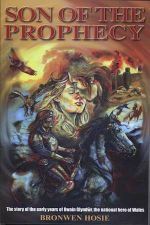 A novel portraying scenes from the childhood, youth and maturity of Owain Glyndwr, prior to his acceptance of his destiny to be the Son of Prophecy of the bards and shouldering the responsibility of leading the Welsh nation as the 14th century closes; for teenage readers. 6 black-and-white illustrations and 1 map. A Welsh version is available.